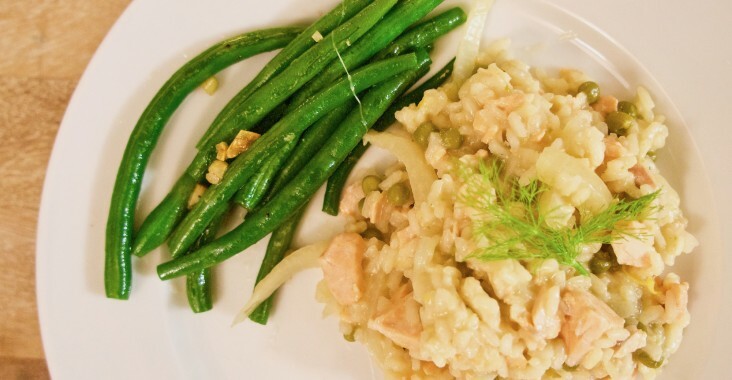 This recipe was born from a good deal on salmon, a desire to use fennel, and a hankering for risotto. It had been a good year since I’d last made risotto, but thankfully it’s like riding a bike–a creamy, stock-infused, Italian bicycle! In a large saucepan, sauté onions in oil until cooked and soft but not browned. Add garlic and cook for another minute. Add rice and stir, toasting the grains thoroughly without browning. Raise heat to high, add wine and reduce until nearly all liquid is absorbed into the rice. Stir in the stock, lemon zest, and juice. Reduce heat, stir and leave to cook covered 15-18 minutes until rice is just undercooked. After about 10 minutes, stir in the salmon. If the risotto looks dry, add some of the remaining stock. Add in peas, stir and cook until rice is done. Add in stock if needed until the rice reaches appropriate consistency. Sprinkle Parmesan on top and serve. A few notes on preparation: Just for added creaminess/cheesiness, I also stirred in a couple wedges of herb and garlic Laughing Cow cheese. This was surprisingly delightful! I loved the lemon flavouring, which added a crisp freshness to the dish and cut through the heaviness that risotto can sometimes have. The fennel also leant a nice depth to the flavours. Its tastiness was maintained in leftovers, over which I’d sprinkle a bit of grated Parmesan before microwaving. Yum!